Jay Gross, left, vice chairman of the Strategic Plan Committee, goes over a Board of Selectmen presentation with Chairman John Wynne. 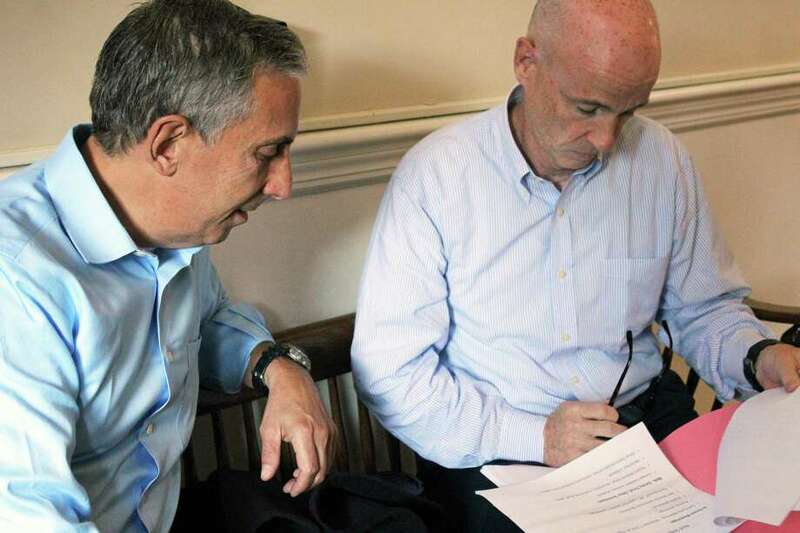 FAIRFIELD — John Wynne and Jay Gross have been tasked with leading a group whose job is to put together a strategic plan for the town. The chairman and vice chairman of the Strategic Plan Committee sat down recently to discuss the committee and its work before giving an update to the Board of Selectmen. Gross is a strategic account sales executive with Hewlett-Packard Enterprises; Wynne has as a career that includes stints as a managing director at Gupton Mars International and as a management principal with IBM as an internal transformation consultant. The biggest impetus for why he got involved, Wynne said, was seeing what was happening at the state level “and what is the state of the state” and where everything would be 10 or 15 years down the road. Not preparing for the impact of state changes on the municipality, Wynne said, would be a big mistake, with the town reacting to change instead of being proactive and ready. “I want to help prevent the town from falling into that,” he said. The committee is an advisory board that will look at the current state of the town, outline potential options to consider for the “emerging and beneficial evolution” of the town, and make a final plan recommendation to the Board of Selectmen. Wynne said to develop a plan that isn’t simply put on a shelf and ignored, there are some key components, including a well-documented plan, and making sure there is the “right kind of community and stakeholder input.” It also needs to include an approach to implementation. Both men said they are excited about the level of community input that will be taking place, including some “do-it-yourself” forums conducted by small groups of students, Representative Town Districts, neighborhood associations and religious groups. While information on the committee’s work, being aided by Chicago-based HLA Consultants, can be found at www.fairfieldct.org/spc, they expect to have a website, www.hlplanning.com/portals/fairfield go live in October. The first community forum will take place Nov. 7 at 7:15 p.m. at Penfield Pavilion. In the meantime, the committee has been interviewing elected officials, and individuals involved in the universities, real estate, dining and entertainment, senior and medical services and emergency services.